Set oven control to broil. Lightly spray cookie sheet with cooking spray. Place tomatoes and chiles on cookie sheet. Broil with tops 5 to 6 inches from heat 10 to 15 minutes, turning once or twice, until lightly charred and blistered. Place chiles in small bowl; set aside to cool. Place tomatoes in resealable food-storage plastic bag; seal bag and let stand 10 minutes. Heat oven to 450°F. In medium bowl, toss onion and garlic with oil. Transfer to 15x10x1-inch pan. Bake 10 minutes, stirring once, until golden and soft. Remove and discard stems from chiles; place chiles in food processor. Add onion and garlic. Cover; process until finely chopped, scraping down sides of bowl as needed. Return mixture to medium bowl. Peel tomatoes over another bowl to catch juices (do not seed); reserve juice. Place tomatoes in food processor. Cover; process until coarsely chopped. Add to onion mixture in bowl; mix well. Stir in reserved tomato juice, the cilantro, salt and vinegar. Store tightly covered in refrigerator up to 2 days. 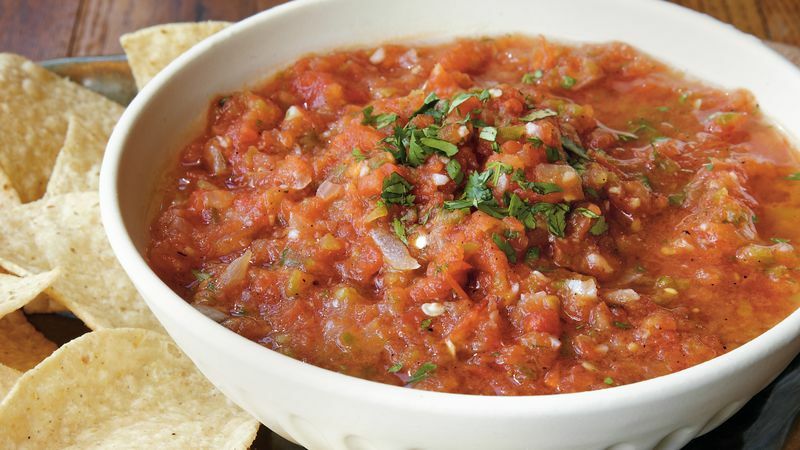 Serve salsa at room temperature.